Highlander frequently orders kung pao chicken whenever we eat at a Chinese restaurant. But he finds that some are chintzy on the chicken and the nuts are almost non-existent. He prefers this classic Szechuan dish to be meaty, nutty, spicy and saucy instead of the “very veggie-fied” versions serve at some of the Chinese restaurants. Highlander also likes the cashew chicken stir-fry from Islander’s Daddy, so based on his recipe she now cooks kung pao chicken for her hubby with his request for more substantial ingredients in mind. 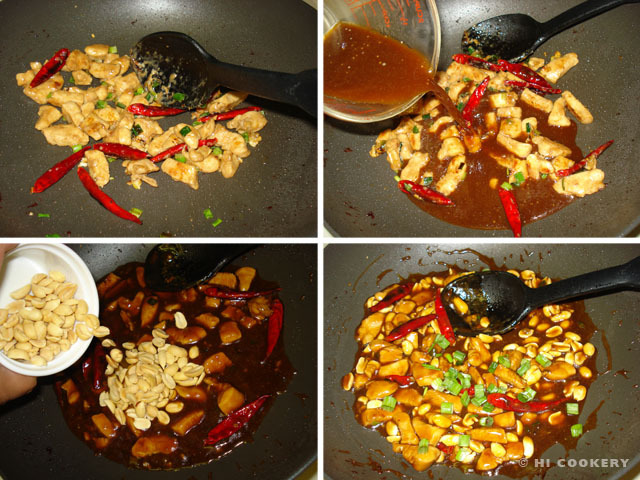 Below is our basic home-style kung pao chicken recipe in observance of National Chicken Month. 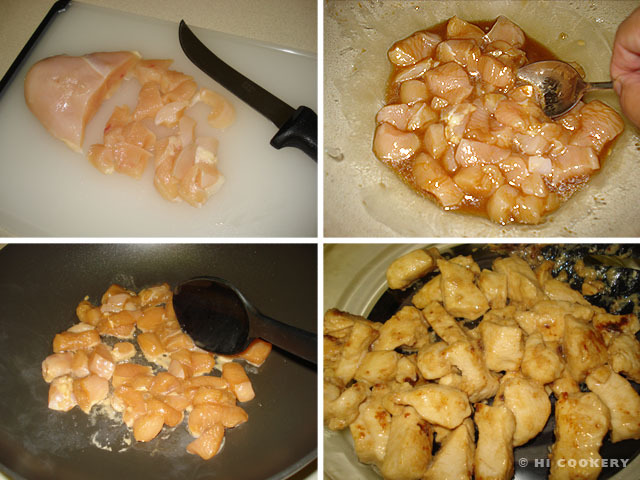 Cut the chicken into bite-sized pieces. In a mixing bowl, combine the soy sauce, sherry, oyster sauce and sesame oil. Mix in the corn starch until smooth. Add the chicken pieces and marinate for 30 minutes. Heat a little oil in a wok or skillet. Brown the chicken and cook ¾ way through. Set aside and keep warm. Prepare the sauce. 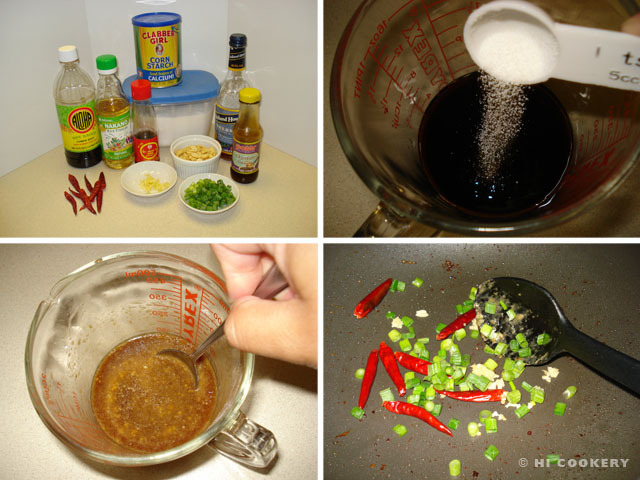 In the same wok or skillet, add a little vegetable oil, if necessary, and stir-fry the dried chili peppers, minced garlic and ¾ of the green onions for a minute. Add the chicken and heat until fully cooked. Pour in the sauce and stir until thickened. Mix in the nuts. Sprinkle the remaining green onions on top. Transfer to a platter and serve hot with rice. Traditionally, Szechuan peppercorns are stir-fried into the dish to add a distinctive aroma and authentic spicy flavor to the kung pao chicken. This may be hard to find in American markets because of a nearly 40-year import ban on the peppers. To add more heat to this recipe, use hot chili oil instead of the peppercorns to saute the chicken and other ingredients. 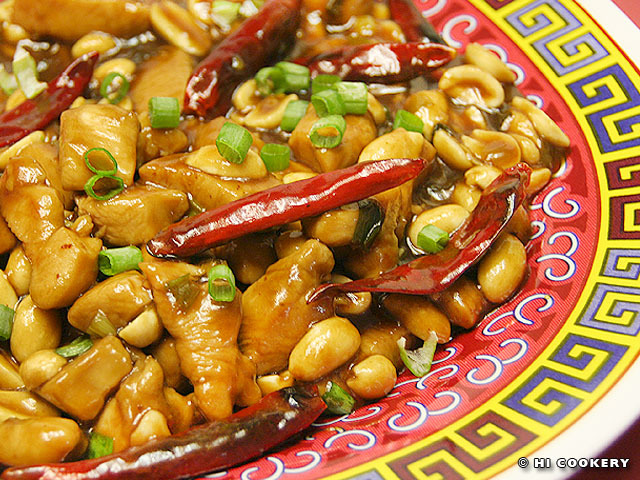 If you like nuts in Chinese stir-fry dishes, try our cashew chicken recipe posted on November 22 (National Cashew Day).